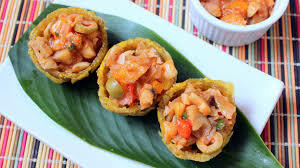 Tostones Rellenos - Stuffed Tostones - Tienditadepuertorico.com - Buy Puertorican Food Here!! plantains and cut them into 1/2-inch rounds. Prepare as for Traditional Tostones. 3 NOTE: You can also stuff the tostones with seafood salad.